Ally Donnelly and NBC Investigators take a look at what's being done in the state of Massachusetts to prevent wrong-way accidents. After a wrong way fatality on I-495 early Friday morning, NBC Investigators take a look at what's being done in the city to prevent wrong way accidents in the future. A wrong-way crash Friday morning in Hopkinton, Massachusetts caused major delays and claimed one life; but some in the state say that new measures could stop accidents like this one before they happen. It was over in four minutes. From the first frantic 911 call reporting a woman was driving the wrong way on 495 North in Hopkinton, to the moment her Nissan Altima slammed, head on into a Honda pickup just before 6 a.m.
Police have not identified the victims, but the wrong way driver died on scene, the man in the pick up was rushed to UMass Memorial Medical Center in Worcester with serious, but not life-threatening injuries. As the NBC Boston Investigators first told you in January – since 2011, at least 23 people have been killed and at least 12 hurt in wrong way crashes across the state. The state doesn’t track wrong way crashes and the data MassDOT has released to us is only current through 2014. After our original investigation, the chair of the Joint Committee on Transportation asked for an emergency law requiring the state to launch a program to better try and prevent these horrific crashes. Eight months later, the bill is still in committee and no hearings have been scheduled. The system would be similar to a pilot launched by Rhode Island in 2015. 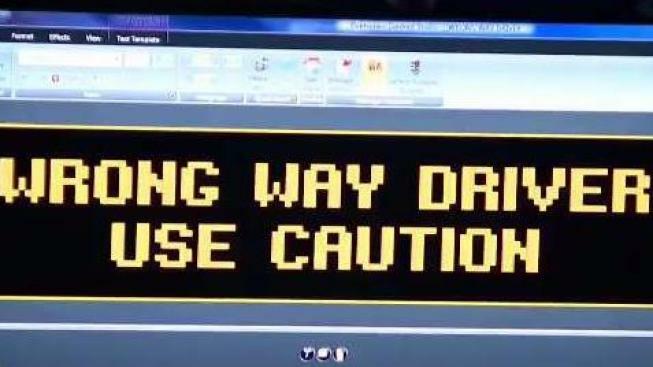 State officials there say that since they installed flashing warning systems at 24 of their worst sites, dozens of drivers have self corrected – turning around and heading back in the correct direction. MassDOT spokesman Patrick Marvin said, they hope to have infrastructure in place for a pilot next year.